Dokteronline stocks an extensive range of sun protection products like Vision and P20. It is common knowledge that sunlight (UVB and UVA rays) can be harmful, especially if the skin is exposed to the sunlight without protection. It is important to be responsible in the sun and to protect the skin as well as possible. After extensive sunbathing changes occur in the skin and often go unnoticed. The effects often only become visible years later. Think of wrinkles, pigment spots and skin cancer. By protecting the skin with a higher protection factor the risk of skin cancer and skin ageing can be considerably lowered. 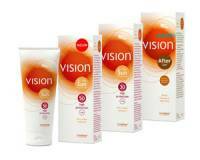 Vision: Uses LyphaZome technology which ensures the protective ingredients penetrate deep into the skin. The gradual release means you can enjoy the sun for much longer after only 1 application. Your skin type and the current intensity of the sun play an important part in this. Make sure you apply a generous layer half an hour before you go out into the sun. P20: One application with P20 provides immediate protection for up to ten hours. With P20 you can enjoy the sun responsively. Apply the sun product generously to your skin, half an hour before you start sunbathing. Make sure to dry your skin by dabbing rather than rubbing after swimming, this will keep the active ingredients for longer. Choose your sun protection with care. If you belong to the risk groups (e.g. light skin, many moles, often sunburnt in your youth) it is important to optimally protect your skin. If you opt for sun protection products available on Dokteronline.com, like Vision and P20, you choose very high quality and that is safer. All sun protection products are available online without prescription.